We are a software OS team trying to bridge different apps to work simultaneously. We have ported BitTorrent Sync so that it can be paired or grouped with other apps. You can try out live right from your web browser. Bittorrent Sync may not be available on demo but it is available on our OS for Raspberry Pi. You can download the OS image and run it on a Raspberry Pi so that you can have a private machine dedicated for your apps. You can find the OS image from below. We always welcome your honest feedback. Please share with us if you have one here or on our forum. PROTA Pi is a new operating system for Raspberry Pi. Raspbian, Raspbmc, or work-alike are great but PROTA takes a different approach on the fundamentals: it installs and operates BitTorrent Sync with a click, connects and controls electronics including GPIO of the hardware, and integrates web services with open APIs. All from a Pi that can be accessed privately or openly via internet. 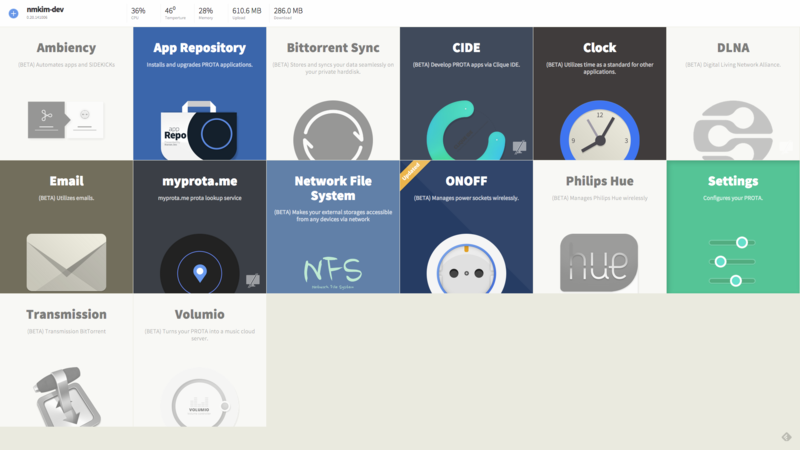 PROTA OS for your Pi takes only a few steps to download and experience. Please check out below. PROTA Pi is the OS of potential but it needs your help. With your aid on PROTA forum, we’ll try our best to keep you posted.